Did you know that Marina Cafe offers Staten Island Catering for our delicious Italian, meat, and seafood favorites? We offer everything from our fresh made sides, soups, and salads to our homemade main entrees and appetizer platters; all served in generous portions fit for even the largest families. Our helpful staff makes ordering and pick-up quick and easy. Simply call us at (718) 967-3077, place your order from our Home Catering menu, and our chefs will get to work immediately on crafting a delicious homemade dinner spread that the entire family will love. Start off your order with one of our delicious Beginnings. Our Cold Antipasto feeds a family of 4 to 6 people and is prepared with Calabrese Sausage, Pepperoni, Sopressata, Provolone, Fresh Mozzarella, Roasted Peppers, Caponata, and Mixed Olives. All for only $48. Or go with our $75 Hot Antipasto containing Clams, Mussels, Shrimp, Italian-Style Meatballs, and Eggplant Rollatini. Add to that one of our freshly prepared soups or salads, such as our $20 quart of Lobster Bisque made with our tender Lobster Meat, Brandy, and Cream or go for our $28 Tri-Color Salad with Arugula, Endive, Radicchio, Sundried Tomatoes, Red Onion, and Pesto Vinaigrette. It wouldn’t be a family dinner without sauce. Choose between a quart of our famous hot or sweet Marinara Sauce ($10), Vodka Sauce ($15), or our Red or White Clam Sauce ($25). Our delectable side dishes serve 8 to 10 people and range from our freshly mashed Yukon Gold Potatoes ($25) and Broccoli Rabe ($45) to our One Dozen Potato Croquettes ($16) and Baby Carrots in Lemon Butter Sauce ($30). 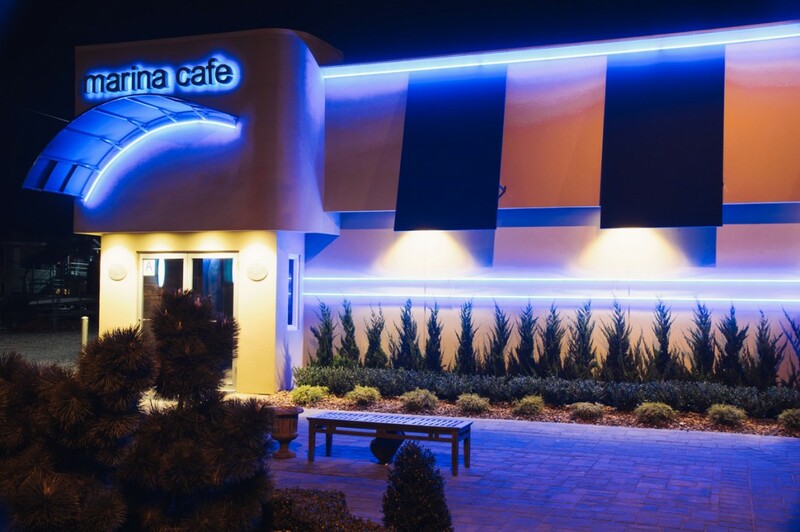 Our main courses are where Marina Cafe really shines through. Pick up our delicious Fusilli with Sausage and Broccoli Rabe for just $48 or our Scungilli & Calamari with Garlic and EVOO over Linguini for just $70. 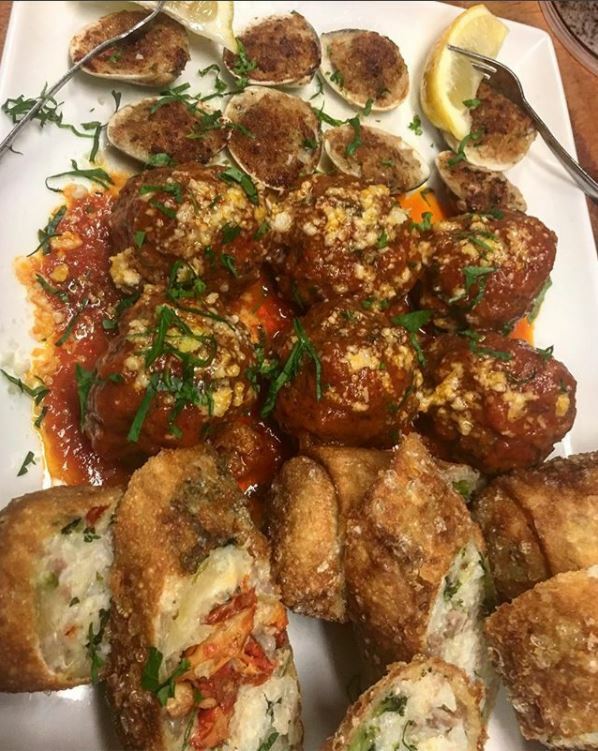 All orders feed 8 to 10 people and no matter what dish you choose we guarantee it to be delicious, homemade, and come with the same top-quality pick-up service that Staten Islanders and beyond have come to expect from Marina Cafe. So call us and let Marina Cafe cater your next family event or social/work gathering! The Marina Cafe is a harbor-view restaurant specializing in seafood and American cuisine. Featuring beautiful views of Great Kills Harbor, the Marina cafe is the perfect venue for parties of distinction! Enjoy Marina Cafe's Staten Island catering at our home, or order and pick it up for yours. Luncheons, Bridal & Baby Showers, Birthday Parties, and all other events are welcome! Looking to book an event? Have a question about our menu or hours? Need catering? Fill out the form below and we'll get back to you as soon as possible.